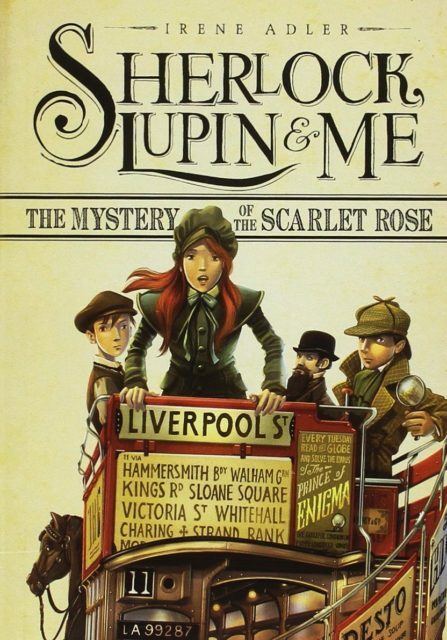 A few months ago, I wrote about The Dark Lady, the first book in Alesandro Gatti’s young adult mystery series, Sherlock, Lupin, and I, about the adventures of Sherlock Holmes, Arsène Lupin, and Irene Adler when they were children. I enjoyed it — it was more fun and inspired than I expected — and I bought the second book, The Soprano’s Last Song, from Amazon, though I seem not to have written about it. Once I received my tax refund — a good deal less than last year, but still a refund — I ordered books three and four, The Mystery of the Scarlet Rose and The Cathedral of Fear, which are also the last two books in the series (of about twenty or twenty-one books) to have been translated from the original Italian into English. When last we left the intrepid trio, they had cleared Arsène Lupin’s father, an acrobat with a traveling circus who does some light thievery on the side, of a murder charge in London. London. December, 1870. Irene Adler and her parents continue to live in London, having relocated there from Paris in The Soprano’s Last Song, due to the Franco-Prussian War. Her friend Sherlock Holmes discovers a strange chess problem in the Times, strange in that it uses no known chess notation. And Arsène Lupin has run away from his father’s circus — with permission before it returns to the Continent — to visit his friends in London. When Sherlock cracks the code — for that’s what the chess puzzle is, a code that refers to three locations in London according to a specific map of the city — the trio approach Scotland Yard with their discovery, only to be completely rebuffed. And when someone is murdered at the first location in the code, they investigate on their own and discover a scarlet rose was left at the scene. Sherlock reveals that Scotland Yard took down the Scarlet Rose Gang twenty years earlier, but their crimes were theft not murder, and when there’s a murder at the second location it seems that someone connected to the old gang is bent on revenge. Then there’s an attack on Irene, Sherlock and Lupin adopt disguise to access some vital records, and there’s a harrowing climax as the truth is revealed. As told by Irene, the story flows well, there’s a nice sense of pace, but the plot is also a bit overstuffed and sometimes hard to keep track of with its plots and counterplots and gangs in the past and gangs in the present. Despite a lot of things going on, The Scarlet Rose didn’t grip me as strongly as the first two books. Yet, the characterizations remain strong — Sherlock Holmes is largely recognizable as Sir Arthur Conan Doyle’s character despite being much younger than the Great Detective, Arsène Lupin is every bit as theatrical as Maurice Leblanc’s original, and Irene Adler, who has far less material to derive from, is the anchor that ties this together, every bit as brilliant as her friends, with a touch of the deviousness of her only canonical appearance. There are also some nice Easter Eggs for Sherlock Holmes fans sprinkled throughout. Gatti picks up two threads from previous books — a developing love triangle (from The Soprano’s Last Song) develops a little more, and the question of Irene’s parentage, raised in The Dark Lady, returns. I hope the fourth book moves these further, because that’s the last one I’ll be reading for a while; I’ve no idea if Capstone intends to release more translations of the series, but it’s been five years since the release of The Cathedral of Fear so I’m not especially hopeful. Still, three quarters of the way through this quartet of books that are available to me, I’m enjoying the Sherlock, Lupin, and I series. There are things I can quibble with (Lupin’s age, occasionally some of the language), but these are minor blemishes. The series is fun, and that’s really all I ask.